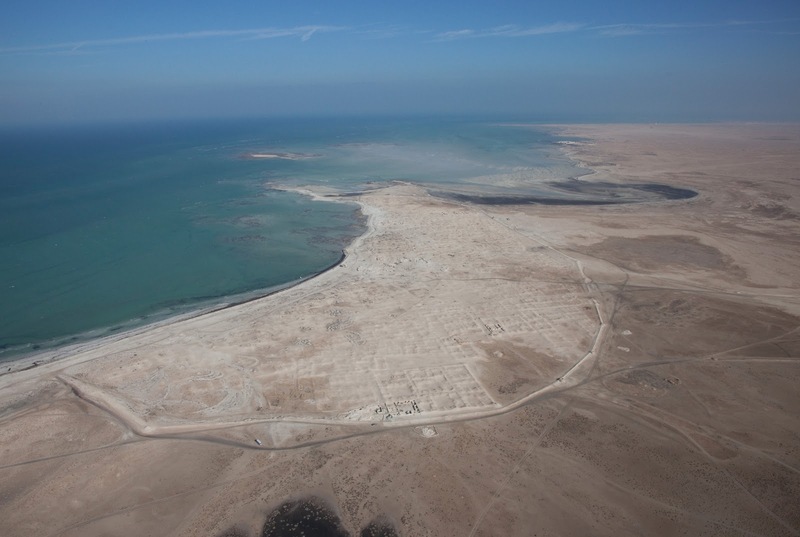 In February this year Bob Bewley organised a Workshop in Aerial Archaeology hosted by the recently founded University College London campus in Qatar. (UCL-Q). The Workshop followed those held in Jordan in 2006 and 2008. This time the presenters were Bob (from UK), Wlodek Rączkowski from University of Poznan (Poland) and myself (UWA). A component of a successful Workshop is to take the students to an archaeological site for which we have aerial photographs to enable them to see at first hand what the photographs add to knowledge and how they aid interpretation. 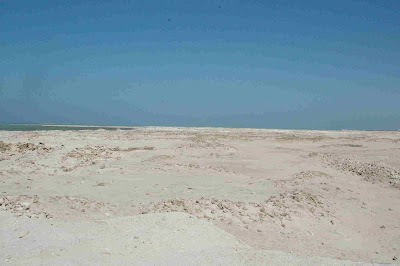 In this case the site chosen was the 18th and 19th century Arab town of Zubara on the north coast of Qatar. Aerial photograph of Zubara, Qatar. Thanks to Prof. Alan Walmsley for permission to use this aerial photo. Zubara began life as a sheltered port for pearl-fishing in the Gulf but grew considerably as a port and processing centre for dates. At its peak it covered 60 ha – a long town with considerable traces of regular layout, several major buildings and a surrounding wall. Canals linked inland to a water source. Today it is completely deserted – apart from a team of archaeologists from University of Copenhagen. The latter are led by Prof. Alan Walmsley, a New Zealander who was a Post-Doctoral Fellow at UWA for two years and worked with me in Turkey at Zeugma. 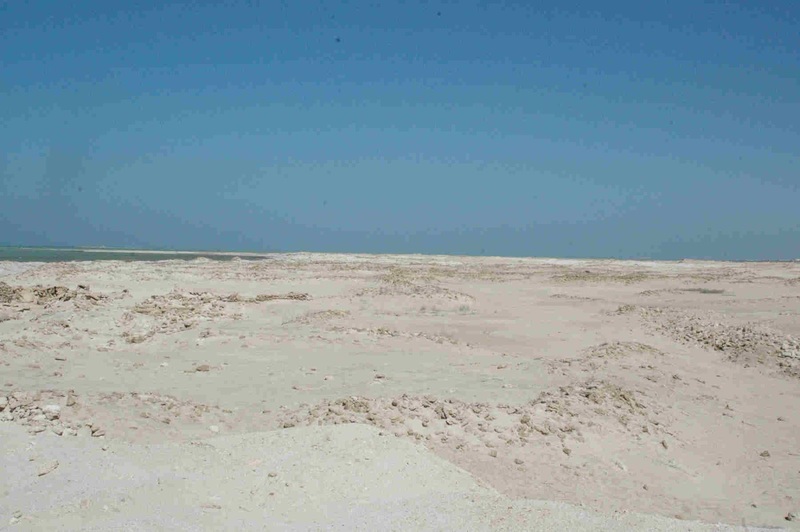 Zubara, Qatar, viewed at ground level. Photo: David Kennedy. At ground level the site is not very informative – many traces of protruding walls, the city wall, the trough of a canal …. From the air it looks superb and details emerge. Better still in many ways, the aerial view gives an immediate view of the entire site and its context in a way numerous ground photos will never do. 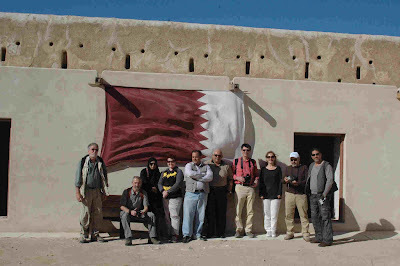 A fuller account of the Workshop can be found in Bob Bewley, David Kennedy & Wlodek Rączkowski 'Aerial Archaeology Workshop in Doha, Qatar: February 10th to 14th 2013', Aerial Archaeology Research Group News (AARGNews) 46 (March 2013): 15-18. The AARG website can be found HERE. Guys, in this article you may learn how to write a critical essay. Check it out!